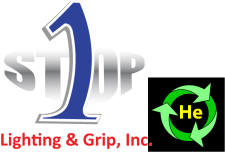 1 STOP Lighting & Grip, Inc. is founded by active I.A.T.S.E. Lighting & Grip Members committed to providing safety, quality and adaptability with the products and services offered. Lighting & Grip balloons are managed by trained and experienced I.A.T.S.E. union technicians that will safely serve your best interest. Our Experienced Staff is available to consult by phone, email or join you on your tech scouts so we may recommend solutions and provide additional information. implemented lighting into the 20XCLOUD enabling this unit to diffuse the day while still providing a clean 1 STOP of diffusion without any shadowing or flares from lights or harnesses within the balloon, then powered up to work as a 16K Tungsten "LIGHTED CLOUD". developed an Internal Gel Kit that surrounds the light source within the our medium size balloons while seamlessly matching up to set lighting using the same gel. In the near future 1 STOP will offer purified helium previously utilized and recaptured from Lighting & Grip balloons. 1 STOP has tested helium purifying systems with great results, we look forward to providing a mobile service that will purify helium from our Low Pressure storage tanks and re-compress it back into 291cf cylinders for use once again. We will keep you informed as to when this service comes available.